I didn’t have a lot of input in it. 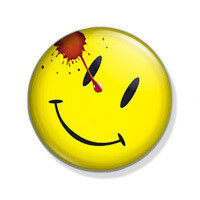 To me anything to do with the movies – as far as I’m concerned, what Alan and I did was the Watchmen graphic novel and a couple of illustrations that came out at the same time. Everything else – the movie, the game, the (laughes) prequels – are really not canon. They’re subsidiary. They’re not really Watchmen. They’re just something different. You can watch the video of the interview below and hear other interesting stories about the creation of Watchmen. His discussion of Watchmen starts at about the 1:07 mark.